The arms are equipped with cameras and grippers to identify and move merchandise while filling e-commerce orders. In another sign that more warehouse workers could be displaced by machines, Hitachi has created a mobile logistics robot that can use two arms to handle inventory. Developed to meet increasing demand from online shopping orders, the machine can move around on wheels, autonomously fetching merchandise and carrying it to a shipping container. Because its arms can hold objects of many different shapes and sizes, the robot could be used to replace human staff doing repetitive picking work in high mix, low volume warehouses, where it would not be cost-effective to use dedicated robots for each different product. 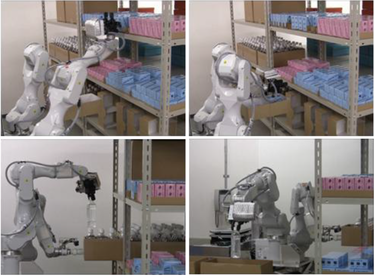 Hitachi has developed an autonomous two-armed robot that can work in warehouses that ship goods for online retailers. For the robot's appendages, Hitachi used two Epson ProSix C4-A901S industrial robot arms, which have six degrees of freedom of movement, and equipped them with cameras that use a computer vision system to recognize merchandise. Hitachi, which has also worked on robots that can go inside nuclear power reactors, fitted each arm with various manipulators serving as "hands" for the robot. They include grippers and vacuum end effectors, which use suction to hold objects. The arms are mounted on two platforms that move up and down on scissor lifts, allowing them to reach boxes at different heights on a warehouse shelf. The platforms are themselves mounted on a mobile cart. The entire robot is somewhat bulky but can move quickly and nimbly because it requires a minimal amount of wirelessly transmitted data to operate, according to the company. "With this technology, the robot can recognize where goods are and begin moving its lifting platforms and arms to grasp them even before it has arrived at the shelf location," a Hitachi spokeswoman said via email. The arms can support one another in handling merchandise. They can pick up objects weighing up to about 1 kilogram, including 500-milliliter drinks bottles. Research related to the robot is to be presented this week at the Irish Machine Vision & Image Processing conference in Dublin. Hitachi envisions using the robot within its own group of companies in Japan over the next few years before putting them on the market in about five years. It did not confirm whether it could be released overseas as well. The development comes amid a push to automate warehouses for online commerce. Earlier this year, California-based startup Fetch Robotics unveiled a pair of robots, one of which has an arm, that work in tandem to fill orders. Amazon.com, meanwhile, has been transforming its warehouses with intelligent machines, particularly Kiva robots, which lack arms but can transport stacks of inventory to areas where human workers unload them.